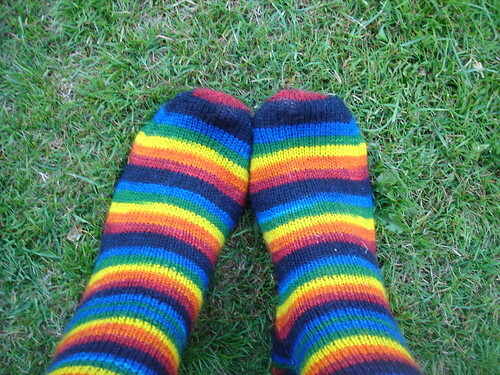 I finished my mystery rainbow knitting! A pair of socks for me. These are my FIRST 4ply socks and I absolutely adore them. ADORE. 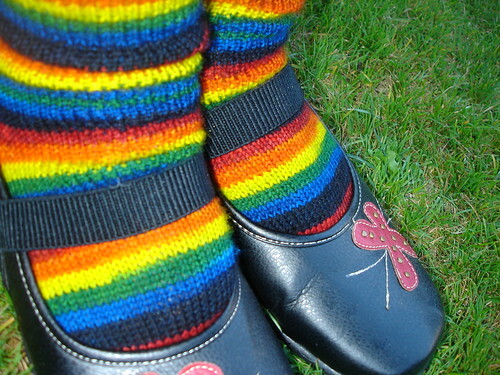 The pattern is called Plain Jane Socks and is a pdf that was used for a knitting class. I'd recommend it if you are new to sock knitting as there lots of extra notes. After a failed attempt at doing a shortrow toe up pattern this plain, no frills, knit-without-thinking pattern was perfect for some holiday knitting. 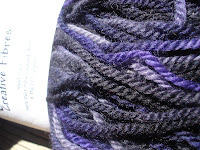 The yarn (bfl/nylon) is from Tri'Coterie in France and part of a soon to be realised range of yarns/relaunch of the shop. I'm helping behind the scenes test knitting yarn so expect to see some more of these delicious yarns being knit here soon. Taking our new xmas wheels for a ride round the block. Feeding the ducks on the way. Feeling blessed to live in a safe neighbourhood where there is lots to see and do. We collected some stones off the beach and bought them home to paint. It was amazing how much the kids were looking forward to this activity. Just the change of materials made the whole thing so much more exciting than just "painting". Some we just painted plain, trying out some different techniques with the acrylic paints. And others we glued on some eyes. They all live in a planter pot by the front door to greet our visitors. 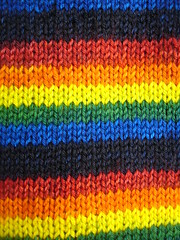 Rainbow yarn knits faster than normal yarn. I'm 50% done so a proper FO picture is still a few days away. 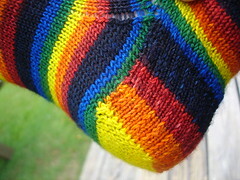 I'm in love with how this yarn has knitted up. A lofty goal but one I am looking forward to trying to achieve. A retelling of the story of Penelope, wife of Odysseus, most famous for staying at home while her husband went off for 20years slaying monsters and sleeping with goddesses. My knowledge of greek mythology is basic , at best, so I enjoyed this story for the 'something completely different for me' aspect. It has a strong feminist take on events which I also enjoyed. Penelope had 12 handmaids who were hanged by her son when Odysseus (finally) returns. Their story forms the backbone of the book and Atwood cleverly uses them as the "greek chorus" - a device I got the full benefit of since I listened to this as an audiobook. Its been years since I read any of Atwood's books. I have the Blind Assassin and The Robber's Bride on my to read list for this year also. The Mortal Instruments by Cassandra Clare - City of Bones, City of Ashes and City of Glass. I devoured all 3 books in a few days. Young adult, urban fantasy (think angels and demons and everything else too). My poor family was sadly neglected while I read these because I simply *had* to know what happened next. Great characterisations, lots (and lots) of action, obligatory love triangle (which was well done, and didn't even make me roll my eyes once), forbidden love, mysterious heritage, family secrets. These books have them all (even a gay teen struggling with coming out). I'll definitely be buying these at some stage for my little brood of soon to be young adults. Near the top of my list of YA books I've read. This is a good one for a knitter Mummy who has bags full of tiny bits of leftover yarn! Blow up your balloons - smaller ones were easier to handle, especially for little hands. 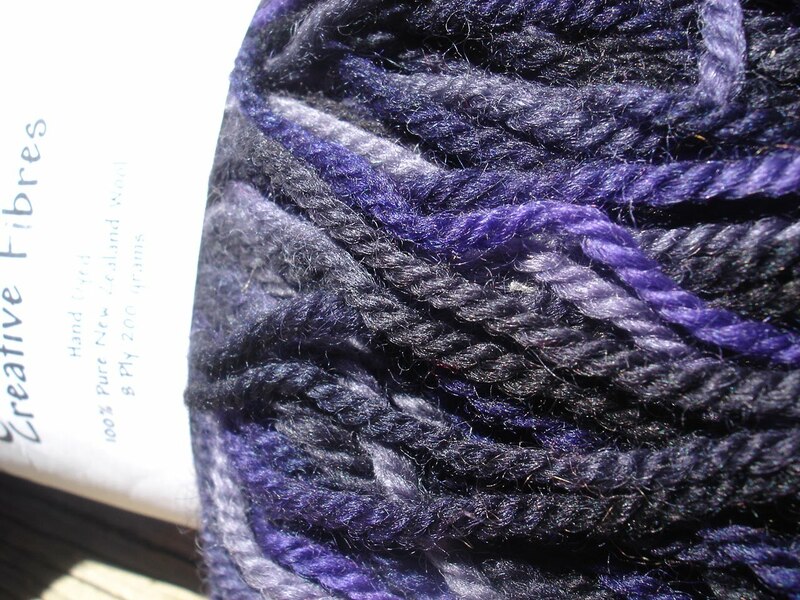 Wet lengths of yarn in your starch solution and wrap around your balloon. Now, after our bit of trial and error , I would advise against short lengths. The ones that worked the best for me were continuous lengths of yarn. You want to make sure the ends are tucked in, and that every bit of yarn is attached to another piece - try to imagine how its going to look once the balloon isnt there anymore. The kids had a lot of fun picking colours and later, deciding where to hang their art. Glasses and mugs make good drying racks for your finished pieces. Leave to dry. Ours took a couple of days. Then carefully pop your balloon and remove. You may need to readjust your sculpture but it will be hard and should retain its shape. We hung some from window frames and others we left as "sculptures". After about 3 weeks some are beginning to deflate a little - it has been very humid and hot here though which has probably contributed to the slow decline. Others, like the little "bowl" I made are still going strong. It's the perfect little size for little bits and pieces which seem to accumulate on my bench. I followed the directions from here which involved making your own starch solution from cornflour (handy since it was in my pantry!). It was much easier to work with when hot, but of course, with little ones that's not to so great. Don't go overboard with it - too much will leave a residue on your sculpture. You can also use starch granules (if you know where to find those!) or wallpaper paste.